We all know that our four legged friends are the best! 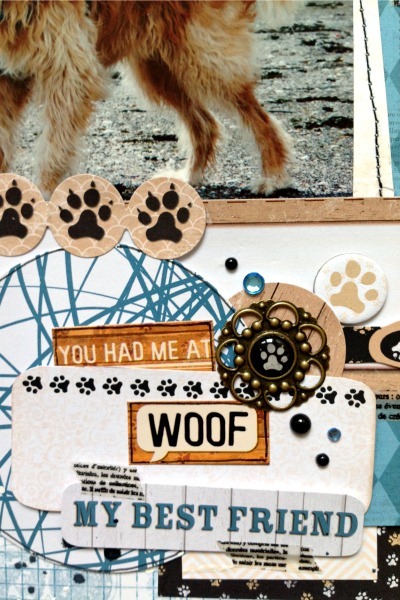 That's why you need the Happy Tails collection in your "stash" of scrapping goodies! When I saw the new Happy Tails collection I felt sure Bo Bunny had designed them "just for me". I took the My Buddy sheet cut in half, flipped one half over and rejoined it with some of the gorgeous washi tape which then made the perfect background for my water mad Colliedoodle Rodney. 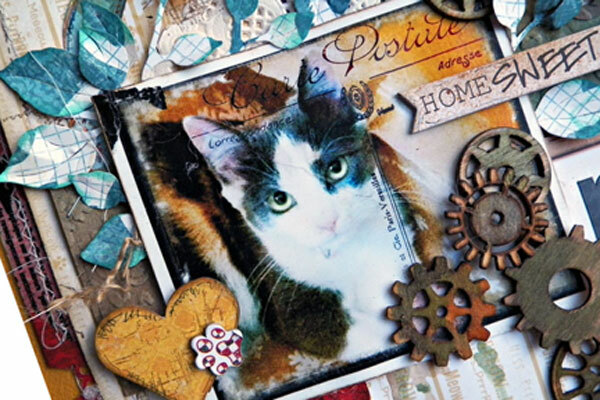 My cluster around the main photograph is made up of elements from the matching Noteworthy, Brad and 12 x 12 Combo sticker sheet. To give it that final finishing touch I added a little more Washi Tape, and the Jewels make the perfect "sprinkles" to give it a little sparkle. 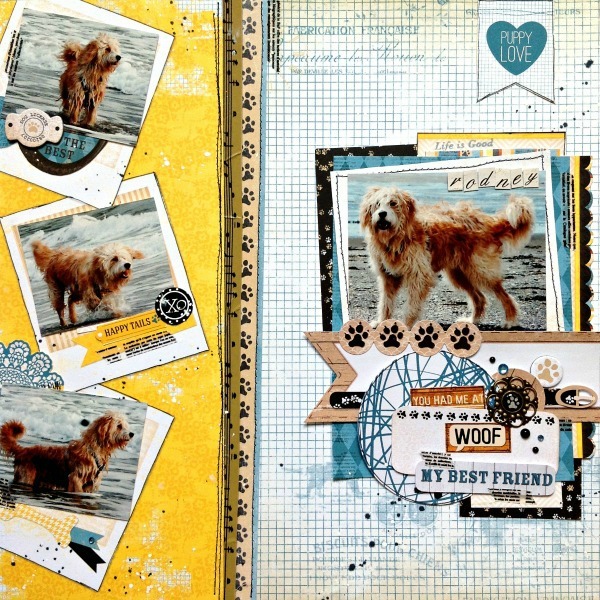 Patterned Paper: My Buddy, Bow Wow, Happy Tails/Happy Tails. Hello BoBunny Fans! Today I am sharing a photo of the newest addition to my family "Miss Minxy." She is now just 6 months old and she was waiting for "Happy Tails" to come along and make the "purrfect" backdrop for her sweet face. 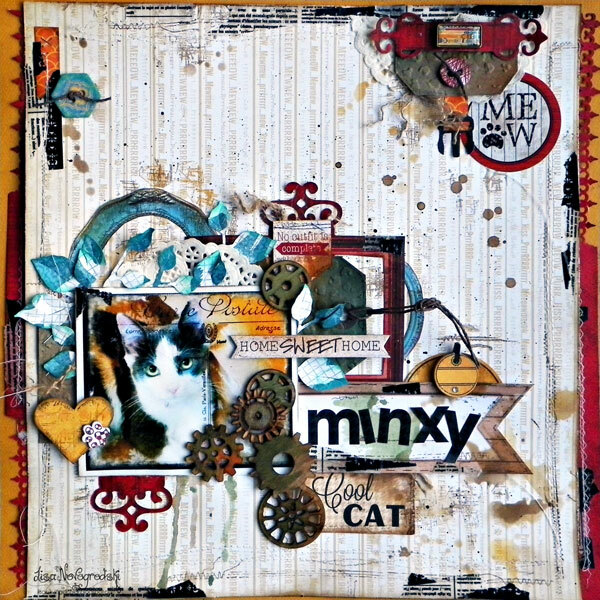 I love a collage style look and BoBunny's "Noteworthy" make this type of scrapping a piece of cake. I've added many bits and pieces beneath my photo including the detail cutting of some frames from the "Menagerie" papers. I'm in love with the new Washi Tapes and used the "Black and White Patterned" along my edges. It lends a very interesting look to the page. I've used a lot of inking in the background along with stamping with my favorite BoBunny Stained Texture Stamps. I covered my wooden gears in a few different color mists to give them a grungy look. My puppy Zoe, is the funniest, shaggiest dog, full of personality! Since she was a pup she always had this adorable little tuft of hair that sticks up from the top of her head. In this photo she was rolling around on the couch and got herself all static, so her hair was sticking up all over. I picked up the soft tan and neutral colors in this collection along with the blue/teals for this layout. I used the neutral color blooms from the Natural Earth bloom collections and the blue bloom from the Denim collection. I also used some of the pleated fabric strips from the Kraft collection to add more natural elements to the page. Designer Tip: I like to save all kinds of odds and ends metal bits in a jar to add extra embellishments to a page. Recently I made a seating board for my nieces wedding that used loads of small frames. I didn't need the backing on the frames so I tore off all the little picture hooks/loops. Here they came in useful as a nice accent on the Kraft strip mixed with a small piece of chain. To add a little more 'real' to the cute die cute leash piece, I did a little bit of machine stitching along the edges of the strip. I also fussy cut some frames (above and below) to accent the page. 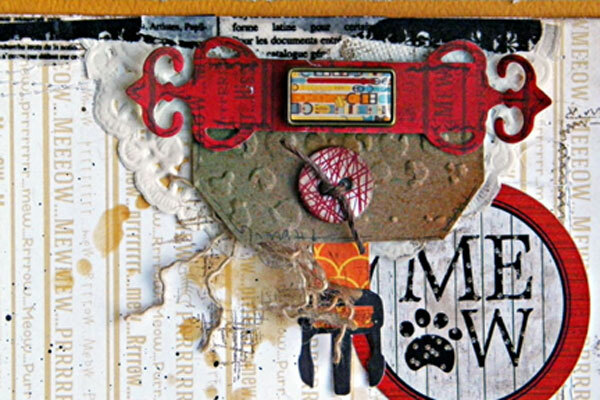 Another favourite embellishment I love from the Bo Bunny collections are the buttons and layered chipboard! I fussy cut the blue frame from one of the patterned papers to create a frame for my title. I finished it with a trinket from the brad collection. I love this so much! I am still in the planning phase of a mini album for my beautiful little Yorkie, I think this collection would be perfect! I can't wait to see it in my local store! All these pages are just so fabulous! Love the paper line and all the inspiration here! These lay-outs are all amazing! You scrapped your dogs in such gorgeous ways! These are all just really wonderful pages and each one is true and unique to each designer's style! Great work!!! Happy Tails is so fun to work with! Gorgeous layouts! My favorite is the first one! LOVE LOVE LOVE the three different takes using this collection!! Gorgeous work ladies! 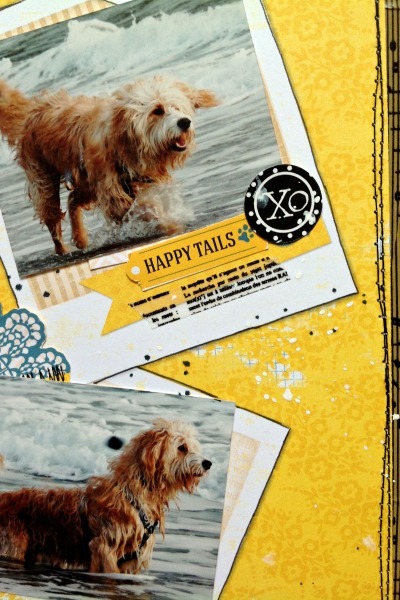 Loved working with Happy Tails!! !